A New York museum has unveiled a memorial to an elephant - which after killing three trainers - was electrocuted in public by the Edison company. The exhibit is displayed on Coney Island - the faded holiday resort famous for its freak shows, fair rides and Russian mafiosi. Topsy was part of a private collection of elephants - one of the tourist attractions on the island at the turn of the century. But after she killed three men in three years - the last a drunk trainer who had fed her a lit cigarette - her owners decided she had to go. They fed her carrots laced with cyanide which she wolfed down without effect. A plan to publicly hang the elephant was opposed by the Society for the Prevention of Cruelty to Animals. 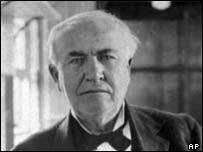 Eventually, the inventor Thomas A Edison came to the rescue. Locked in a battle with George Westinghouse over what he deemed the supremacy and safety of his direct current electrical system, he agreed to electrocute the six-ton Indian elephant. In January 1903, a crowd estimated at some 1,500 gathered at Coney Island, to witness what The New York Times termed "a rather inglorious affair". Clad in copper-lined sandals and covered in electrodes, Topsy was given a huge electric shock. "There had been no sound and hardly a conscious movement of the body," reported the paper. The event would probably have been forgotten if it had not been for two artists - Gavin Heck and Lee Deigaard - who decided to honour Topsy. They have a designed a coin-operated mutoscope (a turn-of-the-century viewing medium) through which images of the execution can be viewed. "She was considered a bad elephant because she killed an abusive handler. 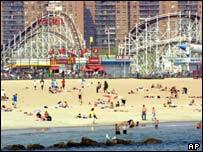 But she wasn't a bad girl - she was an elephant confined and one of the builders of Coney Island," said Lee Deigaard. Mr Heck has devoted five years of his life to creating Topsy art - including a huge sculpture of the elephant - which is exhibited at a gallery in Brooklyn. "I was struck by how a story so old could bring up many issues and feelings for people," Mr Heck told the BBC. "I don't think we are quite there yet with a holistic way of dealing with our own deaths and the way we are voyeuristic about it when it comes to those of animals."